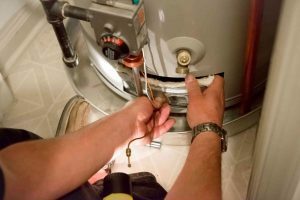 If you need hot water heater repairs in Hyattsville, then Master Plumbing can help. If you need hot water heater repairs in Hyattsville, then Master Plumbing can help. What sorts of repairs do you need? For instance, it’s possible that your hot water heater is leaking. Leaks prevent water heaters from working properly or at their best. Don’t think you can leave a small leak alone – a small headache can become a huge problem in next to no time. Even if you have plenty of experience fixing leaks, don’t hesitate to call the professionals for assistance. Leaks might not be your only problem either since it could only be a sign of something more complicated. If this is the case, you’ll need the experts at Master Plumbing to come to your Hyattsville home. That said, you’ll need to switch off the power supply to the hot water heater. You’ll also need to temporarily stop the water supply. There’s no need to put yourself at risk for an injury during what you might think is a simple fix. Maybe the leak you found starts from the relief valve. You’ll recognize it as the source of the leak because you will see water pouring from it. This leak happens because the water is too hot and has caused the heater to burst. Lower the temperature, to about 120 degrees. Then ensure the thermostat sits tightly on top of the tank. Double check to verify that the thermostat indicating the water temperature is working. If it’s broken, then it’s time to replace it. The relief valve itself might also need to be replaced. But before that can happen, you will need to drain the tank, so there isn’t any more water in it. Next, you will want to check on the inlets. The leak could be from where the cold water enters to the hot water heater or where the hot water flows away. If it’s a small leak, you should be able to close it up by using a wrench. But if that doesn’t deal with the leak, you will need professional assistance courtesy of Master Plumbing. When water starts to leak out of the bottom of your hot water heater tank, then it’s a sign you need a new one. Rust can cause huge problems for your water tank. Even if you have a tankless hot water heater, you will eventually have to upgrade or replace it. Give Master Plumbing a call at (301) 650-9100 or contact us online to get more information on how our expert plumbers can help you with your Hyattsville home’s plumbing system. We have received Angie’s List Super Service Award recognition for plumbing and drain cleaning every year since 2007, in addition to the Best Plumber award from Best of Bethesda. We are fully licensed, bonded, and insured, and our service is unparalleled. Give us a call today—you won’t regret it! To see examples of our projects, follow us on Facebook, Twitter, and Pinterest.